The more things change, the more they stay the same. The Formula One world went through a lot of changes since the 2000 season ended some five months ago, yet when the new campaign started last Sunday at the Australian Grand Prix, the race script very much looked like 2000 "Part II". Unfortunately, tragedy too remained a part of this year's script. The first race of any season hardly ever answers all the questions that are tossed during the winter, but it usually sheds some light at the end of a very long tunnel that was created by speculation, rumours and, especially, the performance of each team and driver during the pre-season testing sessions. 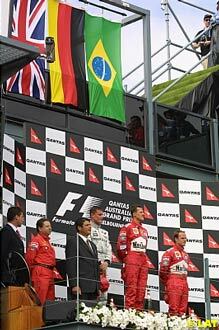 Michael Schumacher and Ferrari proved in Australia that all their pre-season predictions for the 2001 season, as well as the impressive performance of the new F2001, were something more than a psychological game to play with their rivals' mind, clearly dominating the weekend proceedings as they maintained their momentum to win their fifth race in a row. Since September last year, Formula One has seen Schumacher taking pole position and winning the race at every single event, and the prospects of that changing, as Sunday's race demonstrated, are slim, at least for the moment. As was the case in the last few races of the past season, the Schumacher-Ferrari combination was in a class of its own, both in qualifying and during the race and, once more, there was only one driver who looked capable of giving the German a run for his money, and that was Mika Hakkinen. Despite not being able to get close to his rival during qualifying, the Finn was the only man who could keep up with the race leader's pace, until an uncommon suspension failure made him crash heavily into the tyre barriers. Much was talked about the new MP4-16's reliability during the winter, and though indeed the car broke down, that failure was not a clear indication of the serious problems many expected McLaren to have. McLaren boss Ron Dennis was right las week when he said his team's reliability was one of the best out there, and that he preferred a fast car than a reliable one. He knows it's easier to make a fast car reliable, than a reliable car fast. And he surely must know, after the first race of the season, that McLaren will have to work very hard to match Ferrari's pace this year. Behind the top two drivers, pretty much everything remained unchanged. David Coulthard and Rubens Barrichello were again off their teammate's pace, and just like last year, it was the Scot who prevailed over the Brazilian. For most of the weekend, the battle for the "best of the rest" took place between Williams, mainly courtesy of Ralf Schumacher, Jordan, and BAR, though the Brackley-based outfit was somewhat slower than expected after the pre-season. Williams was the only indication that a "tyre war" was in fact taking place again in Formula One. The Michelin-shod teams struggled for most of the weekend, but their problems seemed to lay everywhere other than in the black rubber. Jaguar and Benetton were miles off the pace, and the Renault-owned team saw how Minardi, whose car wasn't even tested before Australia, was too close for comfort during most of the three days. Whatever the problem with their car is, Benetton looks set for a tough year. One of the most anticipated events of the season, the entry of rookies Juan Pablo Montoya and Kimi Raikkonen, lived up to the expectations. The flamboyant Colombian was somewhat disappointing during qualifying, being a second slower than teammate Ralf Schumacher, but he showed well during the race, running in the points until his BMW engine blew up. Watching the on-board shots one could tell that if he doesn't succeed in Formula One, it won't be down to lack of trying. On a day that was marred by the tragic death of track marshal Graham Beveridge, it was rather ironic that one of the main pre-season safety concerns, namely the licensing of the inexperienced Finnish driver Kimi Raikkonen, showed the Formula One paddock that he is the least of their problems, putting a mature and very solid drive to seventh place - sixth after Olivier Panis was penalised. In a race where Coulthard touched wheels with Heinz-Harald Frentzen at the start, Barrichello forced the German into a spin, and Jacques Villeneuve crashed into Ralf Schumacher, Raikkonen's only 23 single-seater races seemed enough to earn him the spot he's got. Just like it happened at the Italian Grand Prix last year, when fire marshal Paolo Gislimberti lost his life after being hit by a flying tyre, it's hard to find a way to explain why Beveridge died last Sunday. "These things happen" or "That's life" are not good enough reasons for the FIA not to do something about it soon, let alone for the marshal's family to find consolation. The eagerly awaited return of the "tyre war" between Japanese manufacturer Bridgestone and its French rival Michelin saw the lap times tumble during qualifying, and also saw defending champion Michael Schumacher clinching his first pole position in Australia, his fifth in a row since the Italian Grand Prix last year. The speculation of someone choosing a harder tyre compound that would perform better during the race, sacrifing grid position, was soon dismissed as everyone except Jaguar's Luciano Burti chose the soft compound. 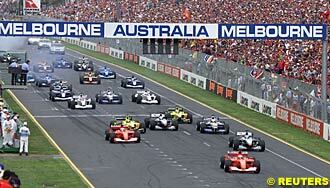 Overtaking at Albert Park is not easy, and track position is vital. As he did in Australia in 2000, Schumacher destroyed his Ferrari following a dramatic double-flip at turn six during free practice, forcing his mechanics to work overnight to have the chassis repaired for qualifying, and the German thoroughly thanked them after grabbing pole. "They had a late night and an early morning due to my problem yesterday and they have given me another fantastic car again," Schumacher said. "They did a good job those guys." Teammate Rubens Barrichello was the first of the heavy hitters to hit the track after a very quiet initial 20 minutes, immediately jumping into first spot. The Brazilian was quickly demoted by Mika Hakkinen, who was the first driver to lap whitin the 1:28 bracket. 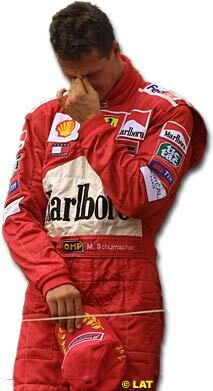 However, on his first attempt, Schumacher lowered his rival's time by more than four tenths of a second. But the German stayed on track, as it seemed the Bridgestone rubber performed better on the second attempt, and he set the fastest lap of the weekend to date, 1:27.516, more than half a second quicker than Hakkinen. Just when it started to look as though Schumacher would sweep the opposition, Barrichello came back to challenge and outpaced his teammate by a mere one thousand of a second. But the excitement was not to last, as Schumacher jumped back onto the track and set an unreachable 1:26.892, more than half a second quicker than the Brazilian and a massive 3.6 seconds faster than Hakkinen's 2000 pole. With this sort of speeds, it would be strange if the FIA didn't decide to take measures to slow the cars down before the expected arrival of traction control at the Spanish Grand Prix. And that was the end of the fight for the top spot. With only a couple of minutes remaining before the end of the session, Schumacher climbed into his spare car, knowing he was already very much in control. "Obviously I knew that there wasn't any chance for Mika to improve his lap time; he didn't have laps left, or enough laps left to go for another run, and the time was over as well," Schumacher explained after grabbing his 33rd pole, equalling Alain Prost's and Jim Clark's record. "We didn't have any run with the T car so far and we just wanted to give the T car a run." Hakkinen was on a quick lap when Jaguar's Luciano Burti lost control of his car and hit the wall for the second day running, forcing the session to be red-flagged, and spoiling Hakkinen's chance of climbing up to the top spot. When the session was restarted, however, the Finn took full advantage of his final attempt and put himself into second place, only to be demoted again by Barrichello, who completed a scarlet front row. The Brazilian was not happy after being called for scrutineer for the second time during the dying moments, and he believed he could have gone faster. "I was a little upset because once again they pulled me into the checking area. 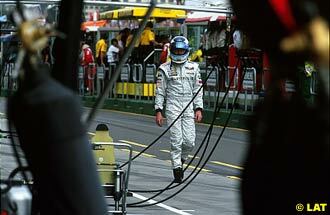 I understand that they just pull out a number but I had already been in there," Barrichello said. "I could have done something different with the car, but there was no time." Hakkinen had to settle with third place, although - like Barrichello - the Finn believed his MP4-16 had the potential to go faster, ending the session more than half a second off Schumacher's time. "I'm sure it could have been better," said Hakkinen. "I did a four-lap run in the end and I was not able to complete a good lap, I always had a problem in some sector, so I always lost a little bit of time. I didn't get the best of the car, but then again I'm reasonably pleased." The Jordan-Honda EJ11 of Heinz-Harald Frentzen was the surprising "best of the rest", taking the win in the first round of the "Honda battle" - clearly outperforming the BAR team, whose drivers Jacques Villeneuve and Olivier Panis could only be eighth and ninth respectively. Despite the return of softer qualifying tyre compounds, the battle between Bridgestone and Michelin was far from exciting. BMW-Williams's Ralf Schumacher was clearly the French manufacturer's top man during the hour-long session, having a promising start for the French company. The German, who was 1.6 seconds off the pole time last year, reduced the difference to 0.8, edging David Coulthard in the second McLaren. The Scot spoiled his first two runs by running off the track, and saw his third attempt hampered by the red flag. Juan Pablo Montoya was the quickest rookie in eleventh place, but more than a second slower than teammate Schumacher. However, the Colombian was not the most impressive debutant, as young Finn Kimi Raikkonen put his Sauber on the seventh row. Meanwhile, Spaniard Fernando Alonso also impressed - outqualifying his more experienced Minardi teammate Tarso Marques, who was unable to lap within the 107% time. The race officials, however, allowed the Brazilian to race, demonstrating once more the rule's poor reliability. As usual in Melbourne, the weather was perfect on race day, and though there were fears about the drivers struggling due to the heat now the cars are more "physical" to drive, they wouldn't materialise at the end of the race. As if they haven't had enough problems during qualifying, Eddie Irvine and Jenson Button were forced to switch to their spare cars due to mechanical problems on their race machines before the start. After qualifying 17th on his first race with Benetton, Button continued his weekend from hell as he saw how his mechanics were still on the grid when the formation lap was about to start. As was the case with David Coulthard in Canada last season, the young Briton was penalised with a stop and go later on. Having spent most of the winter working on improving his starts - of the last four times he had started from pole, he had only made it to the first corner in the lead in Italy - Michael Schumacher got it right and retained his position at the end of the straight. Rubens Barrichello, on the other hand, was much slower off the line, losing three places, while Mika Hakkinen, as usual, made a perfect start to jump right behind Schumacher. David Coulthard probably had the best start of all, but he was squeezed between the Jordan of Heinz-Harald Frentzen and the Williams of Ralf Schumacher, losing his momentum after touching wheels with Frentzen - a very dangerous situation, fortunately without consequences. Behind the leaders, Juan Pablo Montoya was probably the most spectacular starter, overtaking five cars before the end of the straight. However, the Williams driver overshot the first corner and had to run off the track, losing several positions and almost colliding with Olivier Panis when he returned to the track. Gaston Mazzacane was the first retirement when, even before completing the first lap, fire came out of the back of his car. Rookie Enrique Bernoldi would be the next retirement, as he spun on his own and crashed again the wall. Irvine's luck didn't improve during the race, and while Montoya was trying to overtake him, they touched wheels and the Ulsterman spun, eventually rejoining in last place. Up in front, Schumacher and Hakkinen began to edge away from Barrichello, who had passed Frentzen, touching his Jordan and forcing him into a spin while the German was third. Frentzen was less than delighted after the race: "The car was very well balanced and I was enjoying the race, but then on my racing line, Barrichello hit me from behind whilst trying to overtake me and pushed me into a spin. That ruined my race." Jacques Villeneuve was trying to overtake Ralf on the fourth lap, the Canadian slipstreaming the Williams down the straight before turn three, probably leaving his braking too late, running into the back of the German's car. 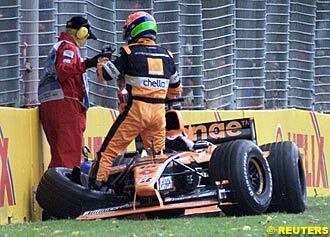 Villeneuve's BAR took off into the air at more than 200 km/h and crashing very heavily against the protecting fences. "I was on the inside of the track going my way and being careful not to make any change of line," Schumacher explained. "I braked and suddenly I felt a huge bang in the back and saw Jacques flying over me." Villeneuve was very lucky that his car turned around before hitting the wall, and when his car came to rest, the 1997 world champion could walk away with a few bruises. Graham Beveridge, a track marshal, was not as lucky, though; Beveridge was hit by one of Villeneuve's wheels that came flying his way like a giant bullet, hitting the marshal at full force, subsequently taking his life. When a tragedy like this occurs, people will always point their fingers at someone, but it's pointless and wrong to put the blame on Villeneuve, the wheel tethers, or the FIA. But it's obvious, though, that something needs to be done to avoid this from happening again. When the safety car left the track ten laps later, Schumacher and Hakkinen continued to dominate, while Barrichello and Coulthard were unable to match their teammates' pace. But the number 1 Ferrari quickly began to set fastest lap after another, slightly getting away from Hakkinen, who could do nothing to close the gap, which on lap 24 was 4.3 seconds. The prospect of the race would suddenly change, as Hakkinen's front right suspension snapped, sending him against the tyre barrier at high speed. Fortunately, the Finn escaped with only a slight concussion. "Something broke on the car, which caused me to go off the track and hit the barrier at the entry of Stewart. I hit the brakes and then lost control of the car," Hakkinen explained. "It was a shame as we were looking good and in hindsight our strategy might have given us a race win." With Hakkinen's retirement, Schumacher's lead over Barrichello was around ten seconds, and things looked good for the reigning champion. 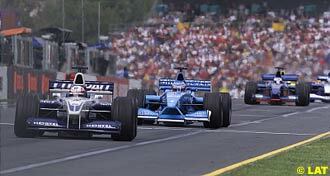 On lap 32, tough, taking advantage of Barrichello being slowed down by Fernando Alonso at the end of the straight, Coulthard was able to pass the Brazilian at turn three. The first and only round of pitstops began around lap 35, with Schumacher being the first of the top players to come in, relinquishing the lead for the first time. Five laps later he would get it back, when Coulthard came in for his scheduled stop. On that same lap, Montoya, who had been driving spectacularly to elevate himself to the points, saw his BMW engine blow up right before he was about to come into the pits to change his Michelin tyres. "It's disappointing that I couldn't see the chequered flag because I had a good race so far," Montoya said. "I first thought overtaking was going to be impossible but now I realise that you can if you plan it - like in CART races - and it's also very exciting. The car looks good and I am quite confident we're going to show well through the season." Montoya's retirement elevated Frentzen, who had charged from the back, to sixth place, sandwiched between the two Sauber drivers Nick Heidfeld and Kimi Raikkonen. The young duo, whose F1 experience together amounted to a total of 17 Grands Prix, ran an impressive and mature race, and the Finn surprised with his coolness when overtaking. BAR's Olivier Panis was also having a good race, running in fourth spot after a quiet day of work. 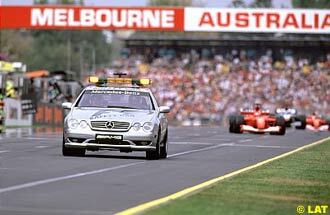 Schumacher continued in front, taking things easy and allowing Coulthard to close the gap. But the German had everything under control and there was little the Scot could do about it. 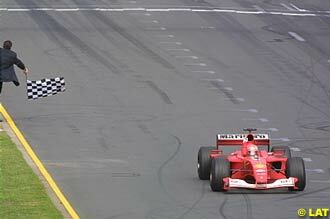 "At the end I slowed my pace, because the important thing is to win, not the margin you do it by," commented Schumacher. "I just wanted to bring the car home, as we have not done many race distances before coming here." Though he finished the race only 1.1 seconds in front of Coulthard to take his 45th career win, Schumacher looked dominant throughout the whole race and his car, as his McLaren rival reckoned, was the class of the field. "They are on the ball. There's no question about that," Coulthard commented. "They are setting the pace and we are catching up." Barrichello finished third, more than 30 seconds behind Coulthard, while Panis was fourth, repeating his teams's performance in Melbourne from last year. But the Frenchman was to be penalised after the Sauber team claimed he had overtaken Heidfeld under yellow flags on lap 2, a claim that was found to be true and would subsequently relegate Panis to seventh place and elevate Heidfeld and Raikkonen to fourth and sixth respectively. Arrows's Jos Verstappen was also penalized for the same infringement, which demoted him to 10th and Prost's Jean Alesi to 9th. Heidfeld erased all the bad memories from his 2000 season with Prost and, most importantly, recovered the promising image he had before entering Formula One with the French outfit. The young German further showed his potential materialized during the final laps of the race, when he kept Frentzen at bay despite the pressure he was putting on him. Panis's penalty meant that Raikkonen finished in the points in his first Grand Prix, silencing all his critics, and earning the right to get a permanent super-license, after being granted a four-race provisional one. "Kimi was a miracle," exclaimed Peter Sauber, "lapping at the same speed as Nick and Heinz-Harald for the last 15 laps and scoring a point on his debut." The Malaysian Grand Prix in two weeks time will shed even more light on what to expect from the season ahead, but from what we witnessed in Australia and despite all the changes, Formula One still belongs to Ferrari and McLaren; to Schumacher and Hakkinen. Some things never change. Before the start of the race Eddie Irvine and Jenson Button switch to their spare cars. The benetton mechanics were still working on Button's car within 15 seconds of the start of the parade lap and he is later given a stop-go penalty as a result. Lap 1: At the start Michael Schumacher gets away well but Rubens Barrichello is slower away. David Coulthard makes a good start but is squeezed between Heinz-Harald Frentzen and Ralf Schumacher and loses ground. Juan-Pablo Montoya makes a good start but slides off at the first corner and drops back. Further around the lap he collides with Eddie Irvine who spins. At the end of the first lap Schumacher leads Mika Hakkinen by 1.2secs with Frentzen third, Ralf Schumacher fourth, Barrichello fifth and Jarno Trulli sixth. Coulthard is seventh. Lap 2: Schumacher continuess to push hard and extends his lead while Ralf Schumacher goes wide at Turn One and drops from fourth to seventh. This promotes Coulthard to fifth. Further back in the field Enrique Bernoldi overtakes Luciano Burti for 17th place while Gaston Mazzacane retires with an engine problem. Lap 3: Schumacher continues to move away at the front while Barrichello challenges Frentzen for third. The two cars collide and Frentzen spins and drops back to 16th. Further back in the field Jos Verstappen passes Nick Heidfeld and Olivier Panis to move to ninth position, suggesting that the Arrows is running with a light fuel load. At the tail of the field Bernoldi spins out and hit the wall. Tarso Marques also retires with an engine problem. Lap 5: Schumacher's lead is 1.3 seconds over Hakkinen. At the back of the track Ralf Schumacher brakes for Turn 3 and Jacques Villeneuve runs into the back of the Williams and is launched into a huge accident. Both drivers emerge unscathed but a track marshal is fatally injured in the incident. A Safety Car is immediately sent out. The crash means that Olivier Panis moves to sixth place. Lap 14: As the field runs behind the Safety Car Jos Verstappen decides to pit, indicating that the Arrows is on a two-stop strategy. Lap 16: The race restarts. Juan Pablo Montoya Giancarlo Fisichella for ninth place while Jean Alesi drops back from 12th to 14th while Eddie Irvine begins his comeback drive passing Verstappen and Fernando Alonso. Lap 17: Kimi Raikkonen is driving confidently on his F1 debut and overtakes Jenson Button to grab 10th place. Lap 18: Button is called into the pits for a 10-second stop-go penalty. Lap 21: Michael Schumacher sets his fifth consecutive fastest lap and increases his lead over Hakkinen to 2.4 seconds. Lap 25: After a period of stability Giancarlo Fisichella has a problem and drops from ninth to 11th. Lap 26: Hakkinen suffers some form of mechanical failure of his right front wheel and crashes heavily at the end of the back straight. The McLaren is heavily damaged but Hakkinen emerges unscathed although he later visits the medical centre for a check-up having received a bump on the head. Fisichella pits and drops to the back of the field. Lap 32: Schumacher's lead is around 10 seconds over Barrichello who is under serious pressure from Coulthard. The Scotsman drives around the outside of the Ferrari to grab second place. Lap 33: Jarno Trulli is the first top 10 runner to pit, dropping from ninth place to 13th. Lap 36: Raikkonen and Burti pit from eighth and ninth places. Lap 37: Schumacher pits and drops to third while further back sixth-placed Nick Heidfeld and seventh-placed Frentzen pit. Lap 39: Barrichello pits from second place and drops behind Schumacher and fourth-placed Panis and Montoya. Lap 40: Panis pits and drops back from third to fourth while Montoya disappears with a smoky engine failure. this promotes Frentzen to sixth place. Lap 41: Coulthard is the last of the frontrunners to pit but he rejoins second and tries to chase after the leader Michael Schumacher. Barrichello is third with Panis fourth, Heidfeld fifth and Frentzen sixth. Lap 48: After a period of stability Verstappen manages to overtake Alesi for 10th place. Lap 50: Irvine pits unexpectedly and drops from eighth to 11th. Lap 53: As Schumacher and Coulthard trade times, fifth-placed Heidfeld comes under pressure from Frentzen. Button retires at the tail of the field. Lap 58: Michael Schumacher wins the race from Coulthard, Barrichello, Panis, Heidfeld and Frentzen. Debutant Kimi Raikkonen is seventh, the last man not to be lapped. Further back Fernando Alonso gives the European Minardi team a debut finish in 12th place. 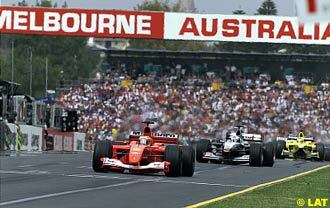 Schumacher led from the start and took his 45th career victory by 1.7 seconds from McLaren's David Coulthard. It was the world champion's fifth victory in a row. Brazilian Barrichello dropped to fifth at the start, but then climbed back to second. He was passed by Coulthard on lap 34 and finished third. MCLAREN (David Coulthard 2, Mika Hakkinen did not finish). Briton Coulthard worked up from sixth place and made a clean pass on Barrichello to take second on lap 34. Finland's Hakkinen passed Barrichello off the line to move into second place but suffered a front-right suspension failure on lap 26. The McLaren left the track at turn 13 and hit the tyre barriers hard, leaving Hakkinen with light concussion. BAR (Olivier Panis seventh, Jacques Villeneuve crashed). Frenchman Panis moved through the field and finished fourth in his first race for BAR. But he was then relegated to seventh when he was given a 25 second penalty for overtaking illegally under a yellow flag. Villeneuve's race ended with the accident that killed a marshal on lap 5. 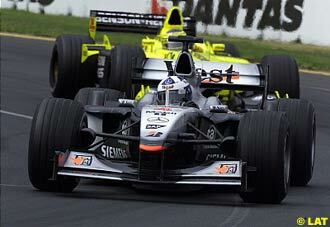 He hit the back of Ralf Schumacher's Williams and his car flew into the air, landing in the gravel trap. German Heidfeld had a hard fight with compatriot Heinz-Harald Frentzen at the end of the race but held on to take his first world championship points. He was then moved further up the standings four hours after the end of the race when Panis was penalised. Finn Kimi Raikkonen completed his 24th single seater car race in impressive form, and scored a point on his Formula One debut after Panis was relegated. JORDAN (Heinz-Harald Frentzen fifth, Jarno Trulli retired). Frentzen ran third at the start but spun into the gravel trap when Barrichello sent him off the track. He recovered quickly and claimed two points. Italian Trulli was fourth until a misfiring Honda engine dropped him down the order and he retired on lap 39. JAGUAR (Luciano Burti eighth, Eddie Irvine 11th). Brazilian Burti was the highest Michelin finisher after starting 21st on the grid. Briton Eddie Irvine went off at turn two on the first lap after starting in the spare car due to a power steering failure. He ended up at the back of the field. He steadily moved up the field, but a problem sent him into the pits. 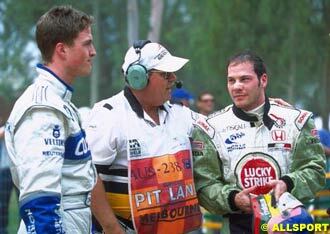 ARROWS Jos Verstappen 10th, Enrique Bernoldi retired). Verstappen started in 15th and ran a steady race without incident before being given a 25 second penalty with Panis. Brazilian Bernoldi struggled all weekend and a lack of time in practice left him with an under-developed car set-up. He hit a wall on lap two and the damage ended his race. Alesi never found the pace he had expected from his car after successful practice sessions and finished one lap behind the leaders. Argentinean Mazzacane started from the penultimate row of the grid and failed to complete a lap and retired his car with concern over a loose brake pedal. MINARDI (Fernando Alonso 12th, Tarso Marques retired). Spaniard Alonso ran towards the rear of the field, but delighted his small team by finishing ahead of the Benettons of Giancarlo Fisichella and Jenson Button. Brazilian Marques raced despite failing to reach the qualifying time required to make it onto the grid. He retired on lap three with an electrical problem. Italian Fisichella struggled with the car and finished the race two laps behind the leaders: "The car was running well and it felt good but then it developed a problem that we are looking into." Button was issued a 10 second stop-go penalty and dropped back. He eventually retired four laps from the end but was classified 14th and last. WILLIAMS (Juan Pablo Montoya and Ralf Schumacher retired). Colombian Montoya ran well and was in the points when he suffered an engine failure on lap 40: "The engine blew up without giving me any warning.". Schumacher was involved in the fatal fifth-lap crash when Jacques Villeneuve hit the rear of his Williams. He spun into the gravel trap to end his race. Pablo Elizalde © 2000 Kaizar.Com, Incorporated.